This weekend, I finally got the tv-out working under linux (Ubuntu 7.10 aka gusty gibbon) on my laptop. Here's what was involved, including some of the (time consuming) red herrings involved in getting this set up. I've included the full xorg.conf files for normal display and tv output at the end of this post. 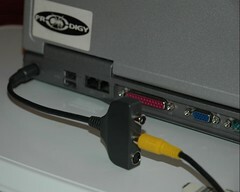 I used the composite video output as that's what I have cables for. I haven't ever tried the s-video output, and I haven't tried the digital audio output since I divorced microsoft windows and threw her things out into the rain a couple of years ago. The quality is pretty poor, but good enough. I think there's a limit of 800x600 for the video out. I'm getting a fair amount of interference on both the video and audio when the laptop is on mains and connected to my amplifier / tv. I'm not sure what the cause it but it's not bad enough to be unusable. I installed the nvidia proprietary (that's a negative word in case you don't live in my world) drivers some time ago in order to get 3D acceleration, and I think this is a prerequisite to running the tv-out. In my intial investigation I came across nvoption, which in theory allows you to turn on the tv-out on the nvidia cards. I did manage to compile and run it after several hours of trial, error and finding build dependencies but when I finally got it built and running I found that it would seg fault when I hit the "apply" button, hurrah! In the process of playing with nvoption however, I noticed the nv-online page that this person has very generously set up. Reading this it dawned on me that nvoption purely modifies the /etc/X11/xorg.conf file, and that I don't actually need the tool to get tv-out running. I had originally presumed (the brother of all ...) that the nvoption tool did some magical proprietary prodding of the graphics card directly. After a bit of searching to find out where the options should go (the device section), I was then able to use the documentation of options in the second frame of the nv-online page to configure my own X. After a bit of experimenting with different options and lots of restarting of the X server (ctrl+alt+backspace) I was able to get the desired result of the display mirrored/cloned on both the lcd and the television. I tried the nvidia-settings gui tool that comes with the proprietary drivers, but it was no use for this task. This tool modifies the xorg.conf file. It did help me recently with a normal dual screen setup (using a crt monitor plugged into the vga port on the laptop), but it was no help for the tv-out, which was not even mentioned in the interface. There is a tool called displayconfig-gtk which is fairly new to Ubuntu that allows you to save named display profiles for different configurations (including dual screen, though it didn't quite behave for me). It can be found under System > Administration > Screens and Graphics. This stores an xorg.conf file for each profile in /var/lib/displayconfig-gtk/locations/, and an index file in /var/lib/displayconfig-gtk/locations.conf. This is almost ideal, as I have created a set of xorg.conf files for my various setups, however it doesn't seem to cope with applying these custom xorg files. Additionally nvidia seem to have a weird way of setting the screen to run at its native resolution of 1920x1600, and this tool doesn't cope with it. This was corrected by selecting the right resolution under System > Preferences > Screen Resolution. Sadly it looks like there are no tools for easy switching X configuration files, so the process for now is involves manually copying the config files. I've created multiple files in /etc/X11, one for each set up including xorg.conf_lcd and xorg.conf_tv. The switching process is then something along the lines of "cd /etc/X11/", "sudo cp xorg.conf_tv xorg.conf", ctrl+alt+backspace (restart x server). If it's any consolation I recall the process in windows involved starting from scratch in a distinctly non-intuitive gui and trying to get a whole load of settings just right, so being able to save the settings is a big step up. I think it took similar amounts of time to get tv-out running under windoze. I guess that's the price we pay for allowing companies to deny us access to the hardware specs so it can be integrated properly. I bought this laptop before I knew how much control I was giving away, and I endeavour not to make such mistakes these days. The "designed for windows xp" sticker has been moved to the equally shiny microwave oven which brings me a small piece of joy when I make porridge in the morning. #Option "metamodes" "DFP: nvidia-auto-select +0+0"